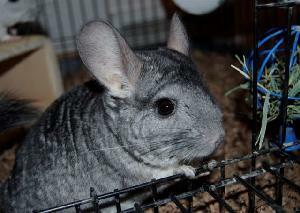 Chinchillas have an elodent dentition, which consists of aradicular hypsodont incisor and cheek teeth. The incisor and the cheek teeth (premolars and molars) grow and erupt continuously. This dynamic change of occlusion leads to potential for the development of malocclusions of the incisors or the cheek teeth. Tooth crown and eventual apical elongation can result in devastating and painful consequences. The diet is tremendously important in creating a "balance" between tooth growth and dental abrasion. 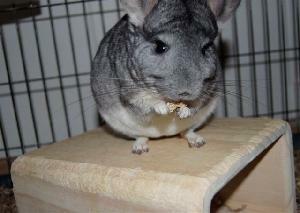 Chinchillas are rodents. Rodents are fundamentally different when compared to rabbits as they have one pair of upper incisor teeth. Additionally, rodents posess other differences in dental and oral anatomy. The lower incisors of the chinchilla have a broad curvature, and extend toward the middle of the cheek teeth. The upper incisors have greater curvature than the lower incisors, and extend nearly to the upper cheek teeth. Notice that the chinchilla's lower incisor extends toward the middle of the cheek teeth. The chinchilla cheek teeth have a level occlusal plane that can easily be evaluated using a straight lateral skull survey radiograph. 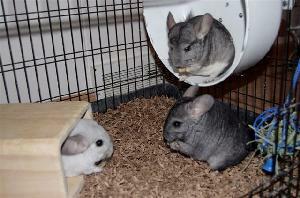 The width of the upper and lower jaws are unequal or anisognathic in the chinchillas. The mandibular cheek teeth are wider apart compared to the upper cheek teeth. This relationship is opposite of the rabbit; where the teeth are arranged in parralel rows with the mandibular cheek teeth closer together compared to the upper cheek teeth. Survey skull radiographs are particularly useful when evaluating the chinchilla. Straight lateral views are useful to evaluate for the incisor and cheek teeth occlusion. Cheek teeth coronal and apical elongation can be assessed. 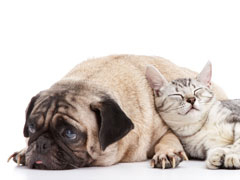 Intraoral and extraoral dental radiographs provide excellent detail of the incisors and cheek teeth. Computed tomography (CT scan) can be especially useful for bone and teeth assesments. Magnetic resonance imaging (MRI) can be helpful for the evaluation of soft tissue structures of the head.